This recipe was a big deal for me. Well, it was the FIRST time I have ever cooked a part of the chicken BESIDES the chicken breasts. I am a white meat lover so I tend to stay with chicken breast recipes. I was browsing the meat section of my supermarket the other day and they happened to be having a sale on drumsticks so I thought I might as well give them a go. 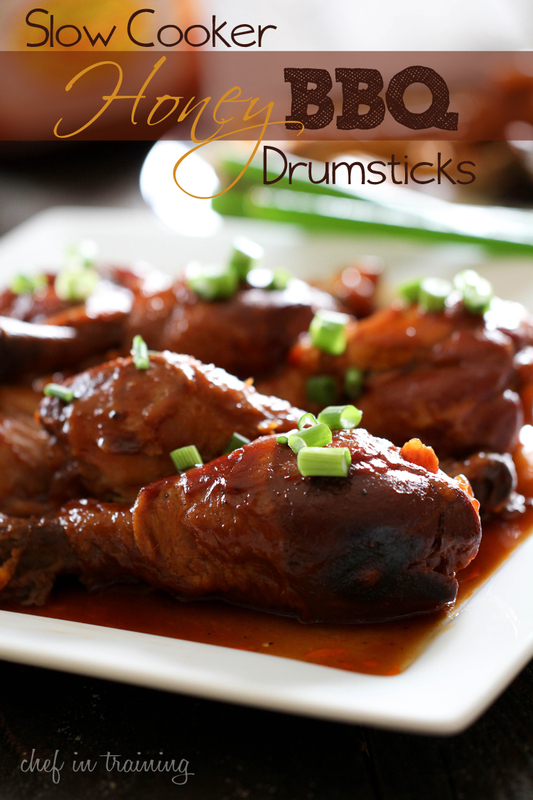 The drumsticks are my hubby’s favorite part of the chicken so I knew he would be happy. I went the total easy route. Let’s be honest- this is about as semi-homemade as it gets, BUT it works, it is delicious, your crowd will love it and no one will ever be able to tell you used a bottle of your favorite BBQ sauce. You can totally use your own homemade BBQ sauce. You can also choose to cut the skin off the drumsticks. I probably would have if I didn’t have to avoid using my hurt thumb. Because I can’t wash my thumb right now and because I struggle to grip anything with my index finger, I decided it was probably best just to leave it on for this particular day. ONLY 3 simple ingredients to create this delicious meal! It is so simple yet tastes like you have been working in the kitchen all day long! Place drumsticks inside. Evenly distribute them as best as possible. In a medium bowl, combine BBQ sauce and honey. Pour evenly over drumsticks. Cover and cook on LOW for 6-8 hours or until done. I have a great recipe for you. I will link it up this coming Tuesday. It is a whole chicken in the crock pot, with seasoning and nothing else. That's right, nothing else, no liquid needed. 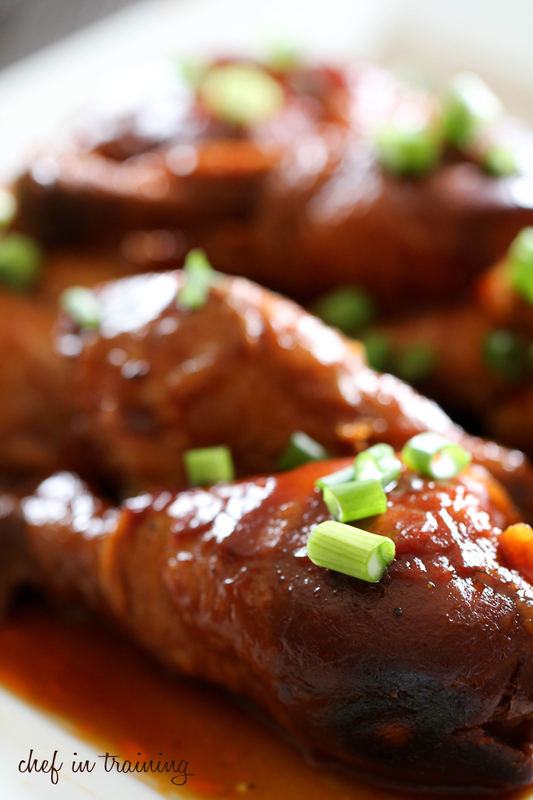 It is the easiest way to cook chicken, it will be tender and moist and fall off the bone. I think if you try it, you will love it and do it all the time. I've done the whole chicken in the crock pot! It's my favorite crock pot recipe. After eating the chicken, you can throw the bones (and the scraps of meat left on them) back in the crock overnight to make a broth to use while cooking or in soups (and you can freeze it if you won't be using it soon). A $5 chicken ends up making multiple SIMPLE meals! Right back at cha, about the name :). I have made the broth from bones as well, but I usually don't do it in the crock pot that night. I will have to try that. Saves a step. I also use all parts of the chicken. I don't particularly love the taste of organ meats, but they are so healthy. So I throw them in and then when I shred any leftover chicken, like for tacos or salad, I also shred the organ meat. That way the taste is masked, but we still get the nutrients! Yum! I LOVE simple recipes!!! These look amazing, Nikki! I'm with you on the white meat. It's my thang. My daughter always complains that it's too dry. She's a dark meat lover! These sound amazing. I love the slow cooker and I love honey barbecue! Simple recipes are the best recipes! I like your addition of honey. I make chicken breast this way with just a bottle of bbq sauce, but I have never thought to add honey to it! This is how I grew up! My mom always put drum sticks in the crock put with tons of bbq sauce! We love sweet baby ray's! OMG those look yummy!!! I will have to try this recipe!!!! I am curious where do you find and get all these recipes? Also, did you get my email about the Oreo Gingerbread Truffles? Thanks. Can you use maple syrup as an alternative to honey? After deciding to go back to school, I am out of the house 2 days a week for work then classes....this is perfect to make up for the family on those nights I am out!! Will try this week! Can I use frozen drumsticks? These look very good, are you sure your in training? lol it appears your pretty darn good! We like chicken legs now and then., wee also like the breasts more than any other, but I do cook up whole chickens yummy! I made this, and it was delicious! I served the drumsticks with potato salad and baked beans. So good!! I've also done this with thighs with the same result. Thank you for commenting... I wanted to know how they turned out!! Most of these comments are about how neat they look and yummy. Thanks again! My husband and I are living in hotel, for 2 weeks, while he attends a class... I'm trying to cook homemade microwave/slow-cooker meals while here. Does this recipe come out just as good with chicken breasts? I love dark and my husband loves white but I'll eat breasts and trying to come up with buying the minimum - as we don't have a freezer for extra. I just tried it last night with chicken breast. Also came out great! Threw 5 drumsticks in with two breasts! Tasty! I am so sorry to hear about your thumb sweetie, hope that gets better soon. I also normally eat white meat but the drumsticks were on sale so I thought I give them a try and I'm glad I did, I made this but added brown sauger and mustard to the BBQ sauce served it with Mac n cheese and jiffy cornbread it was great! I'm making them now. They smell amazing. My drumsticks were frozen, so I threw them in and am cooking on high. I added minced garlic and onion. I have a good feeling about this one! I'm making this tonight! Do you know what the cook time would be for 5 drumsticks? Can u cook with more than 8 chicken legs like breasts also and for how long? Do you think I could put corn in foil on top of the drumsticks and cook both at the same time that way? My Kids have struggled to like chicken drumsticks their whole lives. Yes. KFC. No any other way. Until now. I made my own bbq sauce only because I don't like it-usually to sweet. Anyway this was Amazing. Everyone loved these for the first time ever. How long does it actually take you to make these? Is it closer to 6 or 8 hours? I'm going to leave it on in the morning before I go to work, so i'm not sure what time to set it for. Thanks!